Expert Reconciliation – Let Me Balance Your Books! Payroll – Let Me Run Your Payroll! Invoicing – Let Me Invoice For You! Quickbooks – Certified In All Versions! Accounts Receivable – Let Me Fix This Mess! Accounts Payable – Let Me Manage Your Cash Flow! Behind On Your Books, Business Owners? Let Me Rescue Your Financials Today! As the saying goes, time is money. With all of the other aspects that go into running a successful business, why would you want to spend time trying to analyze and clean up your financial books? As mentioned in our last blog post, performing regular checks and balances on your accounting can take a lot of time out of your day, week, or month, which really adds up annually. For those small business owners who have tried to manage their books on their own, they know it can be quite a juggling act when trying to balance the financial aspects with everything else. When you have to spend time running a financial analysis, learning a new accounting program, or entering expenses, it takes time away from actually managing your business, which can also cost your business money. Save yourself time, money, and frustration; spend time focusing on the parts of running your business that you enjoy by hiring the professionals at Furever Bookkeeping to manage your books. A certified bookkeeper knows the ins and outs of the tax system who can make sure your financial records are current, accurate, and organized. One of the key aspects of any business is staying on top of paperwork, data entry, and timely tax payments to avoid tax penalties, which can lead to increased expenses, legal action, or worse—the failure of a business. It’s also important to track tax payments submissions in case of an audit. A bookkeeper is a valuable resource when it comes to taxes, as we track and enter company expenses so that everything is accounted for when quarterly and annual tax time comes around. Because we specialize in accounting, we as bookkeepers can reduce the possibility of errors by eliminating inefficiencies with your business’s books. This, in turn, reduces the risk of facing costly tax penalties that can seriously harm your business. Losing a business because of inefficient account management is simply not worth the risk. Expert bookkeepers are good at what they do because of proper training and certification, attention to detail, and a determined drive to give the business owner an accurate portrayal of their books. An excellent bookkeeper utilizes their skill set in combination with reliable, up-to-date bookkeeping software that allows them to track and enter business expenses without error. Recording financial information is crucial to having a successful business. Often times, business owners and/or their employees who try to tackle the accounting aspects often track expenditures, purchases, and sales incorrectly or inefficiently. This is not their fault, it is simply that they (in most cases) do not have the proper training and skills necessary to undertake accounting on their own. Business owners then can gain a peace of mind in knowing that certified bookkeepers such as ourselves function as financial watchdogs, because we are dedicated to cleaning up financial books with a bookkeeping management system that works. As a result, business owners can dedicate more time to the things they love and enjoy without worrying about their books. They can rest assured that their financials are in the good hands of professionals whose job it is to maintain the health of their accounting. 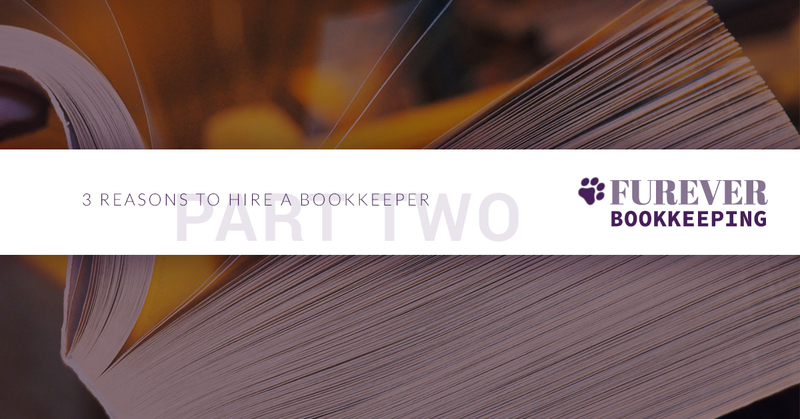 This concludes our short blog series that has explored some of the wonderful benefits of hiring a professional bookkeeper. We hope you have found this information useful. If you have additional questions, would like to learn more about our bookkeeping services, or would like to schedule a free, on-site account analysis, please give our team at Furever Bookkeeping a call today. We’re here to rescue your books, so contact us today! Get Your FREE Financial Analysis! In the Maryland, N. Virginia, DC area? Submit Below & Let Me Rescue Your Books! Our clients range in annual revenue from $200K up to in excess of $32M. Simple or complex financials across MULTIPLE industries are our Core Capabilities. Furever Bookkeeping, LLC brings 15+ years of expert bookkeeping to each of our clients. Kendra Moore and her team have over 37 years experience in: Bookkeeping, Accounting, Banking, along with experience as previous Business Owners. We are approved Accounting & Bookkeeping Federal Government Contractors, DUNS #079524284, as well as for the State of Maryland, NAICS #541219. © 2017 Furever Bookkeeping - All rights reserved.